Ask fellow campers about "Motel 6 RV Park (formerly Country Hearth Inn & RV Park)" and nearby attractions. This was exactly what I was expecting and what I wanted. In the middle of St Robert, right off Highway 44. Concrete roads, gravel pad with 50 amp water and sewer. No cable but good over the air reception. We camped at Motel 6 RV Park (formerly Country Hearth Inn & RV Park) in a Motorhome. 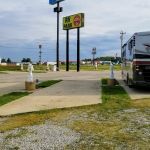 This tiny group of RV pads is behind the Motel 6 in St Robert, MO. We needed to be in town early one morning so decided to try out this park. There are 15 concrete pads in all; they advertise 12 being available; 5 are pull-through, the rest are back-in. All are claimed to be 65 feet long. Our 35-footer easily fit. There was room for slide-outs but not much left over if two RVs put out their slides next to each other. Some of the 15 may not have workable pedestals. We hooked up and were happy with that and did not try to exploit anything else, but supposedly the laundry and ice available in the motel are available to RVers too. The advertised WiFi was non-existent in the RV area. No table, firepit. The pool was drained. There was only a small trash can and the people before us left their trash in bags at our site, but overall it seemed okay. Getting to the park and navigating was fairly easy. The Motel 6 office people were mostly clueless but still helpful in getting the site paid for. These pads are right next to Interstate-44, so it was a bit noisy but not terrible. 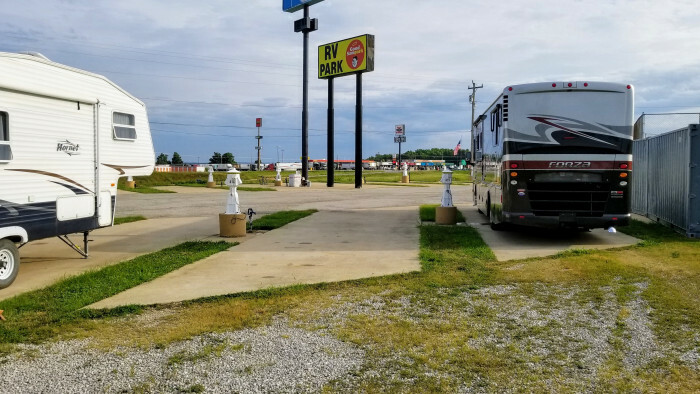 Generally speaking, if you're just looking for a place to park your RV in/near St Robert MO with full-hookups, but don't need anything else, this place is adequate. We camped at Motel 6 RV Park (formerly Country Hearth Inn & RV Park) in a Motorhome. Ft Leonard Wood and Waynesville are close-by and there are a fair number of stores (Walmart) and restaurants (a few steakhouses, Culvers), but nothing up-scale that we saw. We stayed at this park for almost a year. We paid the monthly rate of $380.00. Pros are that they are very convenient to Ft Leonard Wood and they have concrete pads. That is all the good I can say. Cons are that they are right next to the highway exit so you get a lot of semi traffic noise. You have to deal with people "partying" in the hotel. When the pool is open, it leaks into the RV parking lot creating a huge mess. The shower facilities are completely unusable and you have to go into the hotel for a shower. The internet only works about 50% of the time. The cable is very bad also. It only works well in the back in sites. All the pull through sites only get very weak cable signals. The sites are very narrow so you cannot use your awnings and there are no trees for shade. They have one washer ($1.75 per load) and two dryers ($1.00 per load) inside the hotel. Evening time and weekends creates a wait time to use the machines. Water pressure is very low due to leaks in the water lines in the ground. The hotel has recently been purchased by new owners so hopefully they will fix the existing problems. We left due to the management of the hotel stating that they were planning on raising the rates to $420.00 a month in January of 2015 and because they have not fixed anything since they have taken over. For the price they want, it is not worth it for us to stay there. If you are just staying overnight and don't mind sub par facilities, this campground is convenient to the highway and the Army post. We camped at Motel 6 RV Park (formerly Country Hearth Inn & RV Park) in a Fifth Wheel. We have stayed here for the last month and a half. (Paying monthly rates) It is convenient to Ft. Leonard Wood for the last two months of work and daughter's last semester of college. Sites are all cement but close together. You cannot pull out your awnings. You are right next to I-44 so there is always traffic noise. Your view is the freeway and the hotel. There is cable included in the price. You can also walk up to the hotel for a shower and restrooms if you choose. I did use showers twice. There is also one washer ($1.25) and 2 dryers ($1.00) up at the hotel for everyone's use. They worked well, and we never had to wait for them. There is a convenient store/gas station right across the street if needed. Management is very helpful. We had a problem with the water, and they fixed it right away. This park worked well for our needs. We camped at Motel 6 RV Park (formerly Country Hearth Inn & RV Park) in a Fifth Wheel. Updating from our visit in January 2010. Stopped here again in late November since Boiling Springs was full. What an improvement in 11 months! New concrete pads, new hook-up posts that are the nicest I have seen, 20, 30, & 50 amp with a lighted post that can be switched off, and new water bibs. A nice overnight stop right off the interstate. We camped at Motel 6 RV Park (formerly Country Hearth Inn & RV Park) in a Fifth Wheel. We had planned on stopping at Boiling Springs Campground, but there had been snow that day and the lady @ Boiling Springs said the road in was impassable so she recommended Country Hearth just off the interstate. Campground was adequate for an overnight stop, but not much else. Campground is a flat spot behind a Country Hearth Motel, some of the water connections were frozen, electric went out in the middle of the night. It was however, an adequate place for a quick overnight stop in bad weather. Easy access off I-44. We camped at Motel 6 RV Park (formerly Country Hearth Inn & RV Park) in a Fifth Wheel. Are you affiliated with Motel 6 RV Park (formerly Country Hearth Inn & RV Park) ?